Disclosure: This post may contain affiliate links. I receive a small commission at no cost to you when you make a purchase using my link. Click here to read my full disclosure policy. Stop hiding your laundry room. 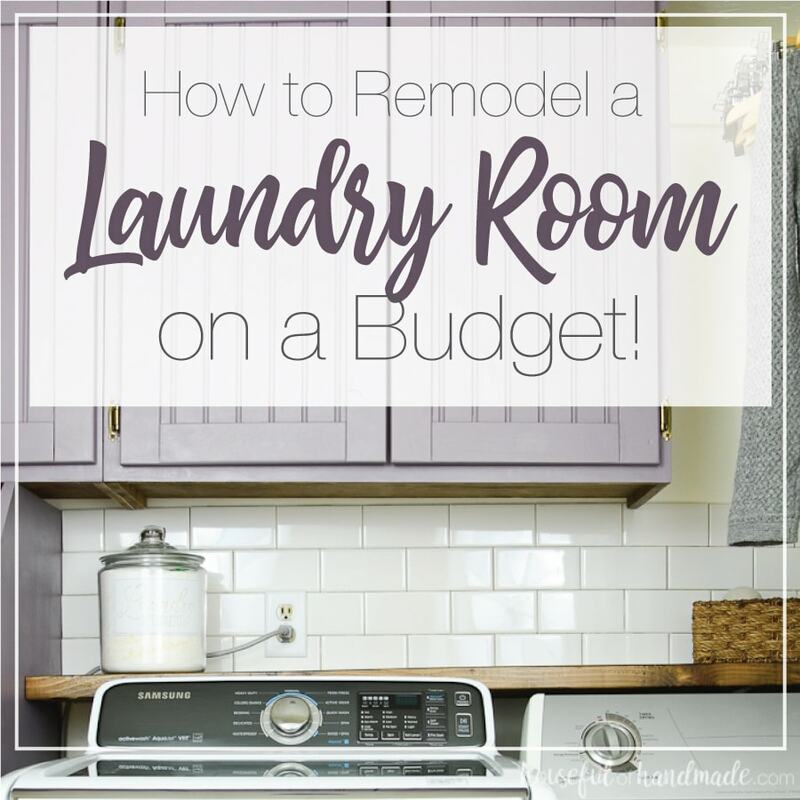 Instead learn how to remodel a laundry room on a budget! Last year I remodeled our entire laundry room for only $100. Yep, only $100! It was part of a wonderful challenge were lots of bloggers pick one room to remodel in just 1 month and for only $100. If that sounds impossible then you are in for a treat. I have a selection of amazing laundry room remodels to show you that prove it can be done! When you are trying to renovate a room on a budget, you have to be a little more creative. You cannot just got to a showroom and pick your favorites. But with a little creativity and elbow grease, you can transform your own laundry room on a budget too! All of the budget friendly laundry room remodels have 1 thing in common, they used paint to upcycle what was old and make it look new. Paint is a budget remodelers best friend! Seriously, there is so much that can be made to look like new with just a couple coats of paint. So instead of replacing everything see if you can paint it instead. But if buying a gallon of paint is not in your budget, don’t worry. Check out these ideas to save you some money! When painting a small room like a laundry room, go through your left over paint. Since laundry rooms tend to be smaller, you can get away with using less than a gallon (or half). You can also add a lot of style by painting one wall with a bolder color (again from the left overs). And if you don’t have a lot of left over paint, or nothing in the colors you were hoping for, check with friends and family. Someone else might just be happy to let you use up their paint stash! In my office & craft room I wanted a warm gray paint, but all I had was a slightly purple gray left over from our living room. So I mixed a little light brown into the cool gray and it made the perfect color. To mix your own color, start with just a few drops added in and mix in more as needed. Make sure to paint a test swatch and let it fully dry before painting the entire room. Have you ever looked at the clearance paint in the hardware store? These are paints that were custom mixed and didn’t turn out as planned. Just because they were not the right color, does not mean they are not great colors! Maybe they just didn’t match what it was suppose to be. But these paints usually cost 1/4-1/2 of a regular gallon! Remodeling a room on a budget is a great time to go through your stash. Since laundry rooms are smaller, you can use up leftovers while giving the new room much needed style. Hiring out work costs a lot of money. 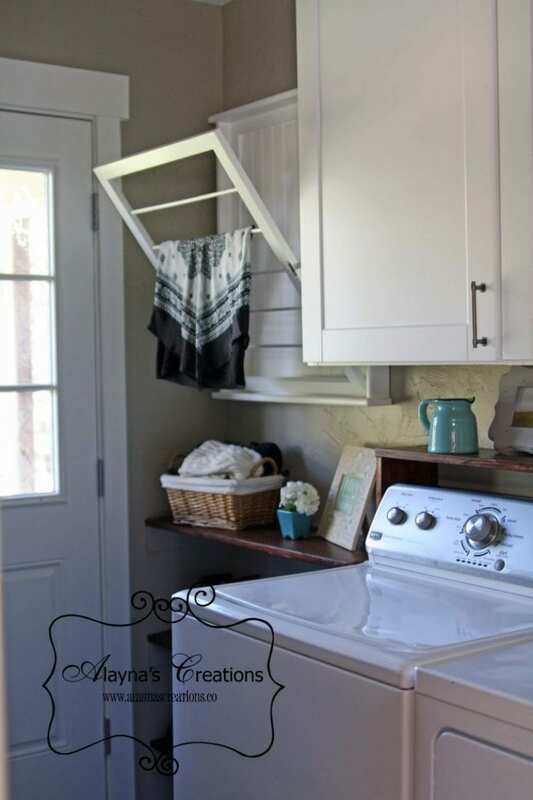 But you can find easy projects that you can do yourself to add storage and function to a laundry room on a budget. 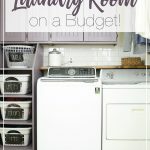 For even more amazing ideas on how to remodel a laundry room on a budget, check out these other $100 Room Challenge posts. And a special thanks to Erin from Lemons, Lavendar & Laundry for hosting the amazing challenge. 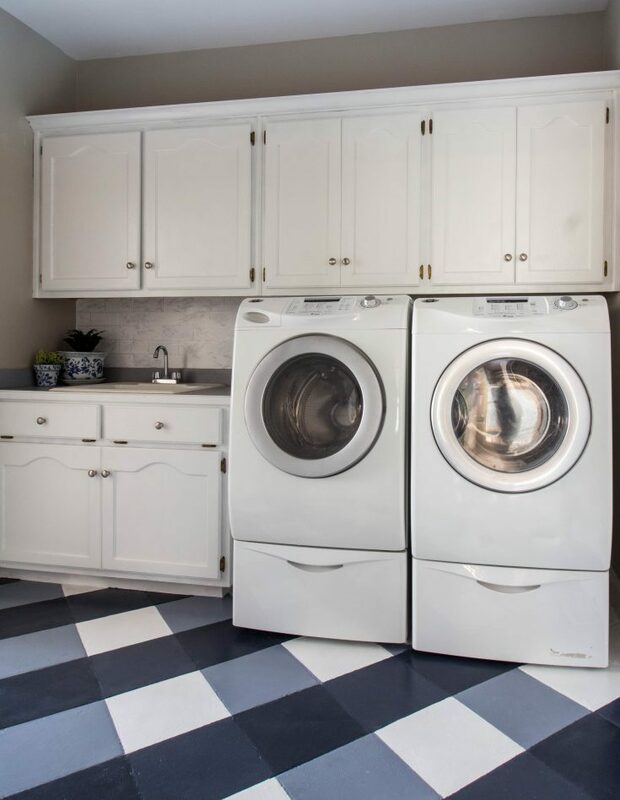 Laundry rooms are usually overlooked. But you don't have to spend a lot of money to transform your laundry room into a space you want to spend some time! 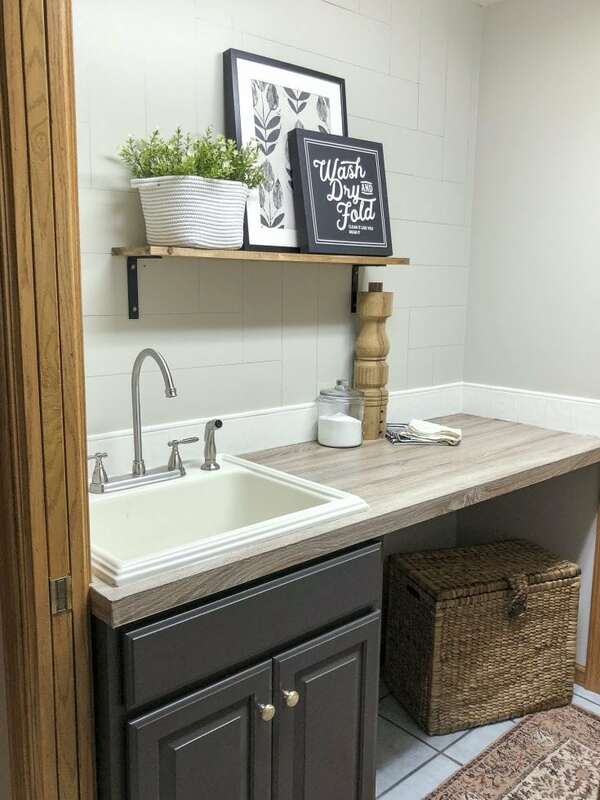 Using hand-me-down cabinets and some DIYs, this closet laundry room was transformed into a beautiful farmhouse laundry room. And the purple cabinets give the room so much style no one can tell it was done on a budget! 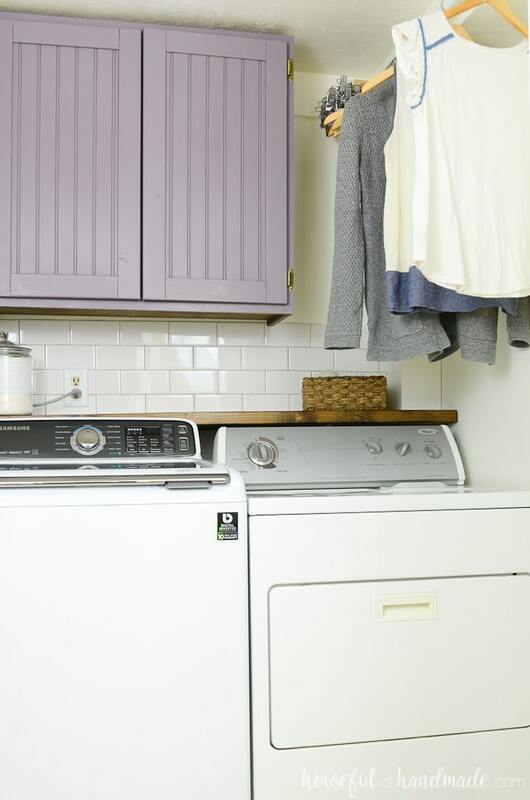 This laundry room was transformed for only $36! She didn't even need the entire $100 budget. And I am so in love with their budget friendly buffalo check floor! 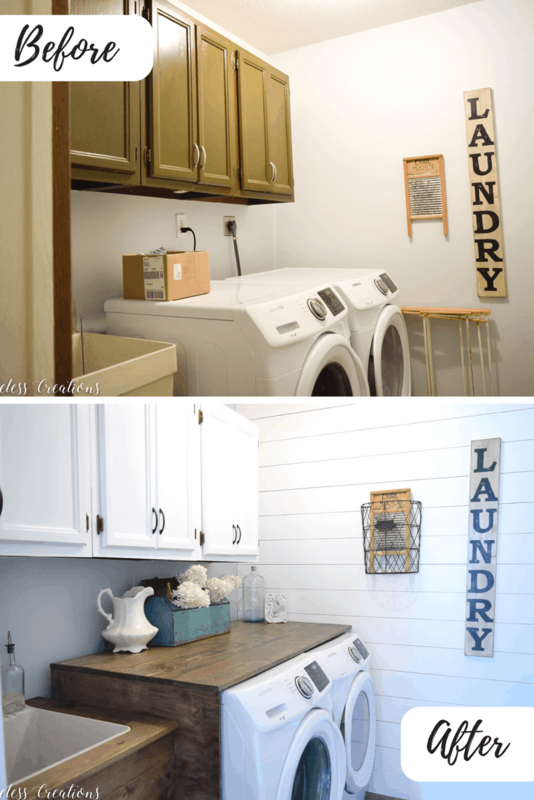 This laundry room was totally transformed with a feature shiplap wall and some painted cabinets. But the true centerpiece is the waterfall counter they created. All within the $100 budget! The before of this laundry room is all 90s oak and Sienna colored walls. The transformation is so amazing and you will never believe how they updated their countertop for less than $20! $100 Room Challenge: The reveal of our bold and colorful laundry/bathroom! 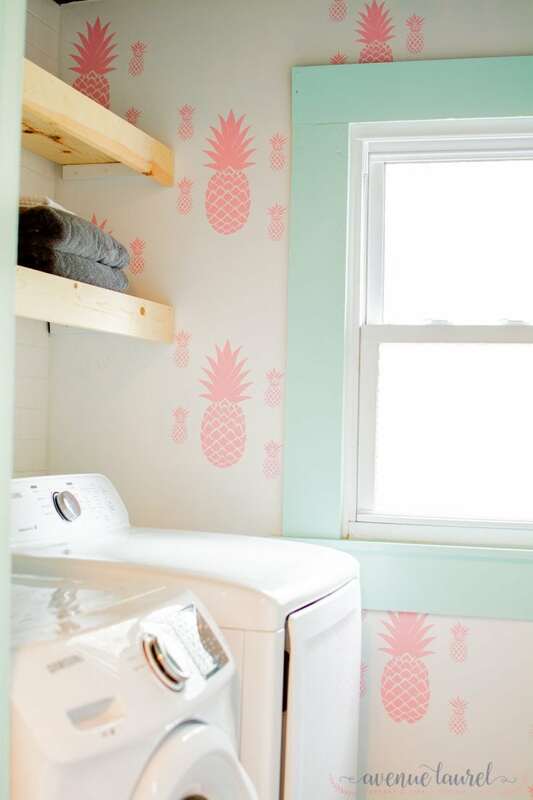 This laundry room transformation is full of whimsy and fun! From the "faux" wallpaper to the colorful trim. And if you have wire shelving you hate, make sure to check out how she transformed her's on a budget! This laundry room is full of storage. And if you hate finding places to hang your laundry, you have to check out her built in laundry drying rack. Subscribe today and gain access to the entire library of printables & downloads. Subscribe and gain access to the entire library of printables & downloads. Don't Miss All the DIY Fun!